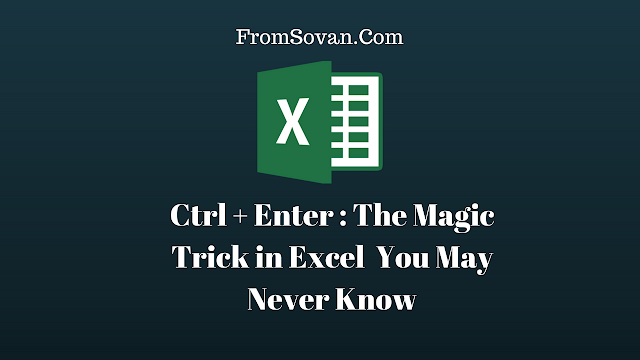 Microsoft Excel has many hidden tricks which you don’t know. Today I will discuss a small but superpower Excel tricks which will increase the speed and efficiency of your daily work life. At first, let me give you an example which many people are often doing. Suppose I have an Excel sheet and firstly I want to write the data and then put same values, text or numbers in a group of cells (It may be continuous or scattered). As shown in the image below, I have selected a group of cells by pressing the “Ctrl” key and put a text “ok”. Now I want to put the same data (in my case i.e. “ok”) in all selected cells. In this situation, if you press “Enter” it will move down the below cell of the selected one and you need to type the data again. So if you follow this process then you need to type all the data one by one. Although you can type your sample data, copy that cell and paste it in all the required cells. It’s also a good option. But you can do it in a smarter way. Let me show you the trick. As I previously did, again I have selected a group of cells by pressing the “Ctrl” key and put a text “ok”. Now, the trick comes into play. Rather than press only “Enter” key, I have pressed “Ctrl + Enter”. After press “Ctrl + Enter”, you will see all selected cells are filled with the same data (i.e. “ok”). It will work for all type of data whether it’s text type or number type etc. I hope you enjoyed this small but powerful trick. Stay tuned with me for next Excel trick. See also: How to Allow Users to Edit Ranges in Excel?